Oregon, Wisconsin bike planning | Vandewalle & Associates, Inc.
Dane County’s communities and residents enjoy an unparalleled quality of life. The area is committed to enhancing and expanding access to outdoor recreation and natural resources; creating alternative commuting and recreational travel corridors for biking and walking between communities is key towards maintaining and expanding this high quality of life. The goal of the Oregon to Badger State Trail is to create a new off-road biking and walking corridor while expanding access to unique natural areas along the route. The project will create the first leg of a regional multi-community trail system. 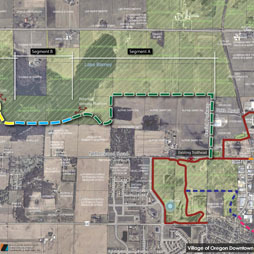 Phase One of the trail system connects the trail from Fish Hatchery Road to Oregon’s Westside Community Park. This conceptual alignment creates a corridor through existing State of Wisconsin and Federal Fish & Wildlife properties, with limited private easement or property acquisition. Adding 2 ½ miles of new off-street recreational and commuting connections along Lake Barney and several glacial potholes/wetlands, this path segment also offers the unique opportunity of construction as early as late 2011 or early 2012 due to the majority of the alignment already being in public ownership. Phase Two & Three connect through the Westside Community Park, along a tributary of Badfish Creek, and run through the heart of the Village to Downtown Oregon. Purchased with State Stewardship Grants, this section creates total off-street trail network of more than 3 ½ miles in length. Long-term connections include an extension west from Fish Hatchery Road to the Badger State Trail and Verona, north along Fish Hatchery Road and the Badger State Trail to Fitchburg, Madison, and Monona, south to the County’s new Anderson Park and Brooklyn, and east to the Capital Springs Trail, McFarland, and Stoughton.